Jacob Schmitz (left) died June 13 after developing a rare and aggressive form of leukemia. Scott Sierzega dedicated his senior year wrestling season to his late friend. Sierzega placed second in the IHSA state tournament last weekend. 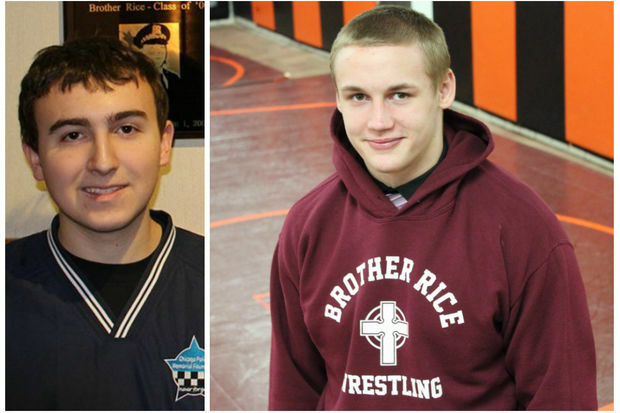 MOUNT GREENWOOD — High school wrestling is not a tag-team sport, but Scott Sierzega of Brother Rice High School said he never felt alone on the mat. Sierzega took second place last weekend in the 220-pound weight division of the Illinois High School Association's state wrestling tournament. It was an unlikely achievement he would have undoubtedly shared with Jacob Schmitz. "I was mad that I couldn't bring it home for him," Sierzega said of his runner-up finish in the 2A division. "But I know he'd be looking down and have a smile on his face about what I've done thus far." Schmitz died June 13 after developing a rare and aggressive form of leukemia. He was the only child of retired Chicago Police Lt. Ellyn Weiss Schmitz and former Deputy Chief Leo Schmitz, who is now director of the Illinois State Police. 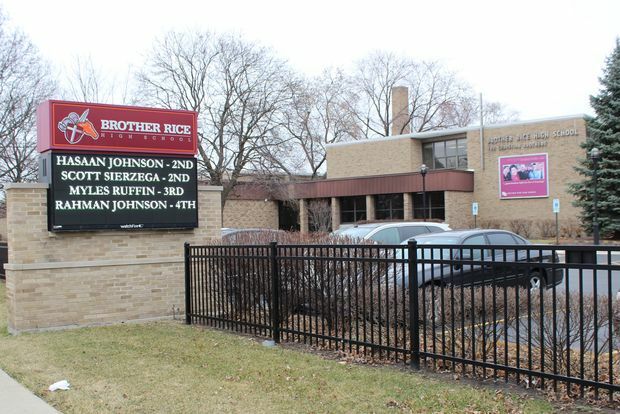 Sierzega and Schmitz met during freshman orientation at the all-boys Catholic school at 10001 S. Pulaski Road in Mount Greenwood. Their friendship developed throughout high school, and the pair were frequently seen gabbing in the hallways and sharing a lunch table. "He was smart," Sierzega said of Schmitz, who scored a 32 on his ACT exam. "His mind could process things very quickly and easily." Sierzega's parents are in law enforcement too. His mother is also a Chicago Police officer, and his father is a retired U.S. Marshal. His family lives in Garfield Ridge, while the Schmitz family is from Mount Greenwood. It was just before a match that Schmitz sent Sierzega a text saying he was diagnosed with leukemia. The news was shocking, but Sierzega said his pal was confident that he was going to beat the disease. So reality didn't sink in right away. From there, Schmitz missed school frequently, particularly as the former valedictorian at St. Christina Catholic School in Mount Greenwood sought a bone marrow donor. But he and Sierzega continued to keep in touch via text and on Facebook. "We'd talk about classes and school," said Sierzega, who added that his buddy admitted to spontaneously singing "The Star-Spangled Banner" once while on pain medication. Sierzega has wrestled since first grade, training with the Vittum Cats Wrestling Club. Schmitz was not as athletically gifted. Though he was a decent runner, Sierzega remembers his friend actually scoring a goal on his own team in a gym class soccer game. But that never stood in the way of their friendship. And Schmitz had other areas where he excelled. In fact, he was voted 2017 class president and was a member of the National Honor Society. When Schmitz died, a cloud hung over the school. 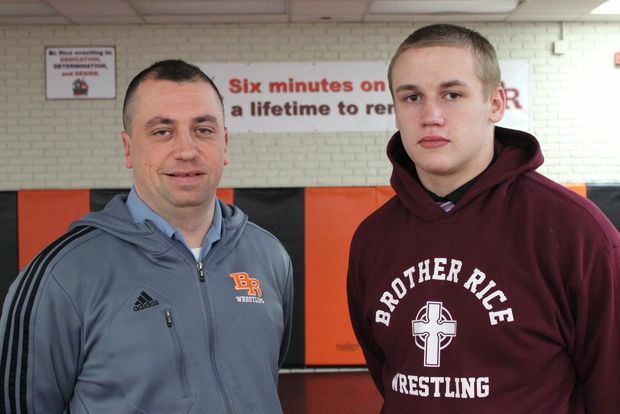 "I think it devastated the whole Brother Rice family," wrestling coach Jan Murzyn said. It hit Siezega particularly hard, and he used his grief to quietly rededicate himself to wrestling. Gone were complaints about summer workouts and weightlifting sessions, Murzyn said. Siezega was anything but a shoe-in for state tournament this year. He didn't place last year as a 190-pounder nor did he place as a sophomore in the Catholic League tournament. But his approach changed after serving as a pallbearer for his friend, Murzyn said. "When he passed, I used it as motivation," Sierzega said. Perhaps Schmitz was looking down on the whole team. Besides Sierzega, Hassan Johnson also placed second in the tournament. Hassan's brother, Rahman Johnson placed fourth, and Myles Ruffin took third place. It was the best showing for Brother Rice in the tournament ever. It was also in that tournament that Sierzega opened up about his inspiration for his senior season. He told coach Ken Bringe about Schmitz on the mat during the grand march ceremony that precedes the final bouts of the tournament. "When he passed, I wanted to do everything I could, everything in my power, to get as far as I could," Sierzega said.